Following a three year process of analysis and discussions on the fiscal structure of our oil tax and my past attendance at two advanced international courses in London on World Fiscal Systems for Oil & Gas, led me to conclude that SB21 should not have passed. On March 20th, the Senate passed SB 21, the Governor’s oil tax reduction bill, by a narrow margin of 11 yeas and 9 nays. I voted “no” on the bill because I believe the tax breaks are too generous for oil produced from Alaska’s legacy fields of Prudhoe and Kuparuk. It’s not necessary to reduce the tax in the legacy fields where production is already economic at current prices. The net present value and the internal rate of return surpass the industry’s hurdle rate and are extremely profitable. Today, the value of the remaining reservoir is higher than the cumulative value of all the oil produced to date. A 2011 court decision found there are approximately 7 billion barrels of proven reserves that are “technically, economically, and legally deliverable” in the legacy fields. This value is slightly under $800 billion at current oil prices and those prices are estimated to go up. In my speech on the Senate floor, I gave many reasons why a lower tax in the legacy fields won’t result in increased production such as: the processing facilities are at maximum capacity; the amount of industry investment necessary to reverse the decline and make up for the surrendered revenue is staggering and not likely forthcoming; and Prudhoe is an aging field with a natural parabolic decline curve that has a minimal relationship to the tax rate. The debate behind declining throughput in the Trans-Alaska Pipeline System is especially troubling because the Department of Revenue is forecasting a 5.5% annual decline rate, while just last month ConocoPhillips told investment analysts on Wall Street that they predict a 2-3% decline in the next few years. There was also testimony at Senate Finance last year that we will be experiencing a 2-3% decline for a few decades. The Department of Revenue’s exaggerated decline rate is just one example of erroneous information being used to make this decision and skew the fiscal impact. Another change in the tax structure embedded in SB 21 which I oppose is the elimination of progressivity. While I support a less progressive tax on the sale price, I don’t support eliminating progressivity altogether. Progressivity is built into the tax code so Alaskans, who own the oil, are compensated for the value of their hydrocarbon at international rates. On the Senate floor, I also warned about the unintended consequences of this bill should it fail to increase legacy field production and offset the magnitude of the surrendered revenue. Alaska’s AAA credit rating will likely be downgraded as the state is forced to spend its savings to make up for the budget deficits we’ll face starting next year and for the foreseeable future. Of the $16 billion we currently have in savings, $11 billion is needed for the state’s unfunded liability to the retirement system. Without drastic budget cuts, the remaining savings will be gone long before any increase in production can make up the deficit. At that point, the state will have few options at its disposal besides a statewide income tax, sales tax and/or dipping into the Permanent Fund. The bottom line is that the oil in Alaska’s legacy fields is an extremely valuable resource on an international scale and is owned collectively by the Alaskan people. The production tax rate is nothing more than the selling price of that resource. As legislators, it is our constitutional obligation to make sure that Alaskan’s wisely reap the maximum benefit from that resource, and the bill passed by the Senate falls far short of satisfying that constitutional mandate. On the week of March 4th, I traveled to Washington D.C. to preside over the Energy Council’s 2013 Federal Energy and Environmental Matters Conference. As the Chairman of the Energy Council, I was pleased with the level of attendance and the impressive line-up of presenters that spoke to the Council. We had a very interesting meeting on energy exploration in the arctic where we heard a presentation from our very own Dr. Mark Myers, the Vice Chancellor for Research at the University of Alaska Fairbanks. We also heard a report from the U.S. Department of Energy’s Acting Assistant Secretary for Fossil Energy, Mr. Chris Smith. I was particularly interested in a presentation from Mr. Adam Sieminski, the Administrator for the U.S. Energy Information Administration. He said the Administration is forecasting the price of oil to increase to $150 per barrel within the next few years. There were many other notable presentations and break-out meetings during the four day conference. I’d like to thank all the presenters for their contribution and I also want to thank all the participants from the 12 member states and 4 Canadian provinces. My sincere thanks to Ms. Lori Cameron, the Energy Council’s Executive Director, for organizing the conference and assisting me in making it another informative and successful event. 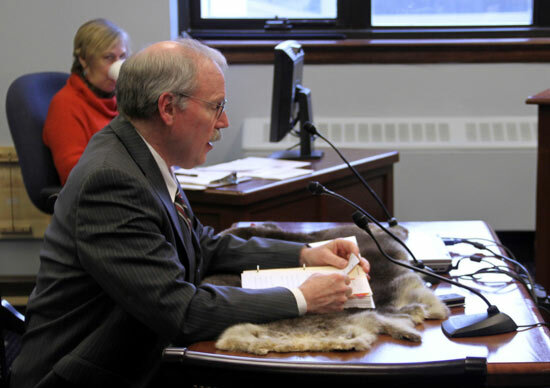 Senator Stedman testifying in the Senate Resources Committee on SB 60 regarding sea otters. 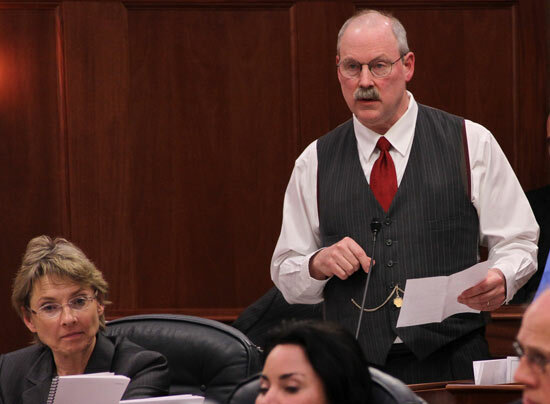 On March 15, the Senate Resources Committee passed Senate Bill 60 out of committee. This bill, which I introduced last month, proposes paying a $100 subsidy for each sea otter legally harvested by an Alaska Native. The over-abundance of this marine predator is decimating the shellfisheries in Southeast for crab, clams, abalone, sea urchin, sea cucumber and geoducks. The alarming and unsustainable growth in the population of sea otters has gone unchecked in Southeast for too long and is now having a serious impact on subsistence, commercial and personal use fisheries. Sea otters are protected under federal law and managed by the U.S. Fish and Wildlife Service (USFWS). In the absence of a realistic management plan from the federal government, we have to act before the shellfish biomass in Southeast is completely decimated and the sea otters starve. Senate Bill 60 now moves to the Senate Judiciary Committee where I look forward to discussing the legal options at the state’s disposal for managing the sea otter population. In other good news, the Senate Finance Subcommittee in charge of the Department of Public Safety’s operating budget added intent language at my request. The language amendment reads, “Money appropriated to the Alaska State Troopers under this appropriation may not be spent to assist federal employees in enforcing the Marine Mammal Protection Act of 1972 as it relates to sea otters in Southeast Alaska.” The USFWS has refused to update its sea otter management plan since it was first drafted 19 years ago even though the plan calls for an annual review and revisions every three to five years. Since they have adopted a hands-off approach to managing our sea otter population, state funds should not be used to assist them in harassing Native Alaskans who wish to legally harvest sea otters. Julie Isom, my office manager and legislative assistant, just reached her five-year anniversary working for the State Legislature. Julie is the first person you meet when you stop in my Juneau office during session and she runs my Ketchikan office during the interim. She schedules all my appointments, meetings, and travel arrangements, in addition to a number of other very important office duties and responsibilities. 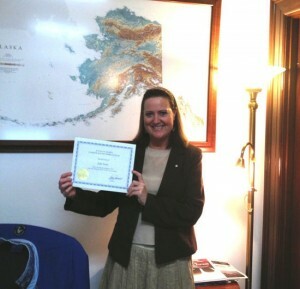 In recognition of her service to the state, Julie received a certificate and a commemorative pin from the Governor. Thank you Julie for all you do and congratulations! 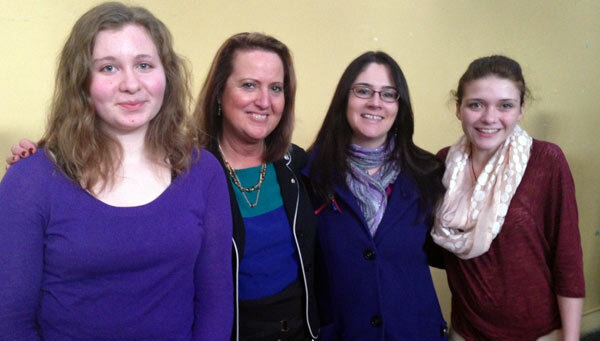 Annamarie Pike from Sitka, Julie Isom from my staff, Brandi Prefontaine from Naukati, and Brittni Tully from Ketchikan at the Poetry Out Loud state finals in Juneau. I would like to congratulate the students from Senate District Q who made the state finals for the Poetry Out Loud Program, a National Recitation Contest promoted by the Alaska State Council on the Arts and the Juneau Arts & Humanities Council. The competition, presented in partnership with the National Endowment for the Arts and Poetry Foundation, is part of a national program that encourages high school students to learn about great poetry through memorization, performance, and competition. On March 19th, ten high school students from around the state participated in this event at the Juneau Arts & Culture Center. Annamarie Pike is a sophomore at Sitka High School. Annamarie discovered poetry last year when her sister competed at the state level of Poetry Out Loud. Like all younger sisters, Annemarie felt compelled to continue the tradition and loves reading and memorizing poetry. Her extracurricular interests include debate, drama and circus arts. Her higher education goal is to study broadcast journalism in college. Brittni Tully is a senior at Revilla Alternative High School in Ketchikan. This is Brittni’s third year participating in Poetry Out Loud and her second year competing in the state competition. Along with recitation of poetry, Brittni is also a part of the drama, debate and forensics team. Brittni plans on attending college to pursue a future career in forensics animation. Maintaining a high GPA, helping out in the community and filling out college applications has kept Brittni busy this year.